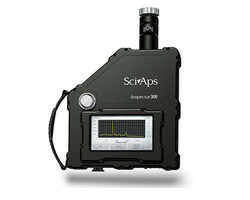 The Inspector 500 is configured with a 1,030 nm laser and a cooled InGaAs detector. It’s engineered specifically for analysis of high-fluorescence samples, for example those samples with complex molecules or many contaminants. The “500” class of Raman analyzers is equipped with higher wavelength Raman excitation (1030 nm laser) for the specialized case of testing samples that exhibit high fluorescence. For example, samples consisting of complex molecules or samples with a number of impurities are excellent candidates for the Inspector 5001030nm. While such samples may challenge the Inspector 300, the 500 allows for the specific Raman peaks to stand out in the spectrum. 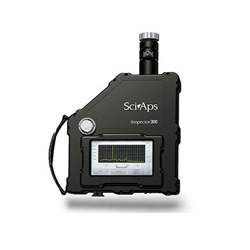 As with the rest of the SciAps Agent series of Raman analyzers, the Inspector 500 offers high stability, the same intuitive software and interface, fast processing speed, and seamless report generation and data management. • Higher Excitation: Higher wavelength Raman excitation (1030 nm laser) for the specialized case of testing samples that exhibit high fluorescence. For example, samples consisting of complex molecules or samples with a number of impurities. 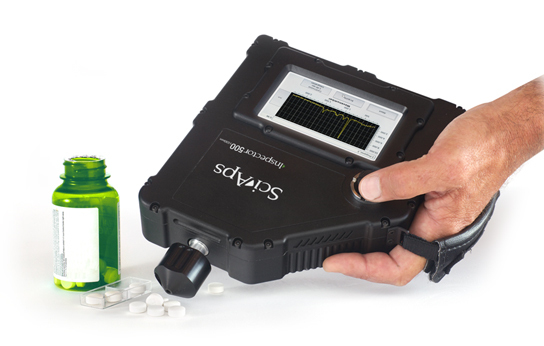 • Good mechanics: The Inspector 500 is equipped with a vial holder, a novel 90-degree sample tester ideal for bagged samples, and a point-and-shoot adapter, allowing for easy testing of virtually any sample type. The point-and-shoot adapter is user adjustable to sample depth, allowing easy adaptation to thick or double-bagged samples, or sample bottles. The spectra in figures 1 and 2 below illustrate the advantage of the 500 model in an extreme case, for samples that yield high fluorescence response to Raman. 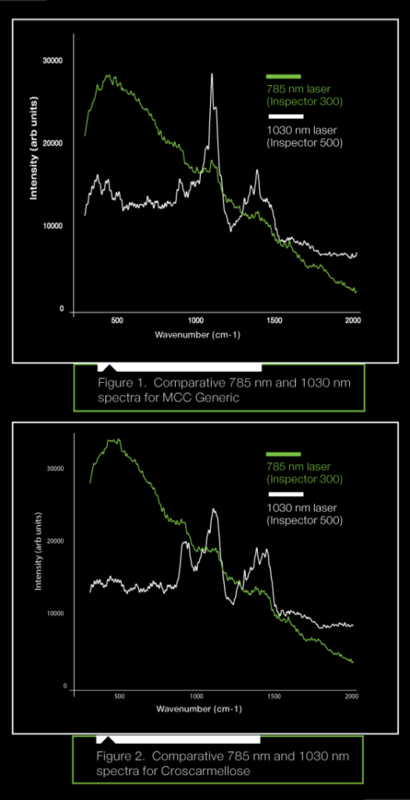 The green line is the response from the standard 785 nm wavelength Raman laser.Its spectrum peaks are completely obscured by the large amount of fluorescence. Alternatively, the 500 model (white line), by virtue of its longer, 1030 nm wavelength, does not produce the same level of fluorescence, therefore clearly revealing the Raman spectral signature. 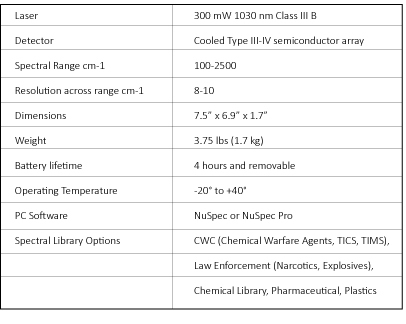 For a small minority of compounds, the Inspector 500 series may be a better choice than the industry standard 785 nm laser wavelength (Inspector 300 series). Such compounds are limited to complex molecules such as proteins, or samples with significant impurities present. For more information on The Inspector 500 please visit our Knowledge Center.